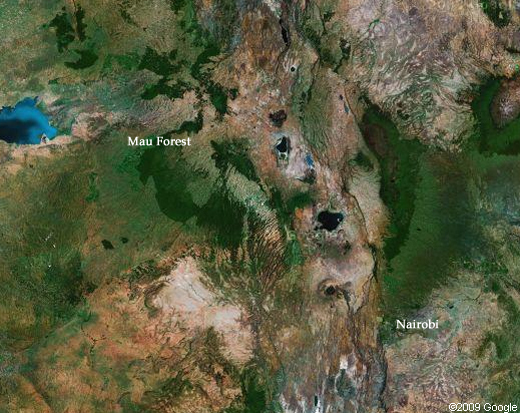 Kenya has launched an appeal to help save over 400,000 hectares of forest from further damage. The Mau Forest, which is Kenya’s largest forest system, lies to the north-west of Nairobi and has suffered from agricultural encroachment and illegal logging encouraged by state-led corruption. Over 100,000 hectares, or about 25 per cent of the original cover, of the forest has been severely damaged in the last 20 years, but a huge appeal for US$ 400 million hopes to reverse this demise. Being the largest forest in Kenya the strategic importance of the Mau cannot be underestimated. Aside from the massive biodiversity value of the landscape the Mau is the most important source of water in the Rift Valley and Western Kenya. If “business as usual” is allowed to continue it could result in a regional water crisis, with impacts felt far across the Kenyan boundary. The Mau forest feeds many of the main rivers in western Kenya that provides the massive lakes Victoria, Turkana and Natron with their life-source. The effects of deforestation on water supplies is well documented and with the uncertainties of climate change looming protecting trees in Africa has never been more vital. The Mau is home to an extraordinary number of plants and animals under threat from this destruction, including the endemic Parasol Tree (Polyscias kikiyuensis) and the East African Bongo (Boocerus eurycerus isaac). The forest is also home to the long-persecuted Ogiek people, who live under the constant threat of eviction, and it’s also of great spiritual importance to the Massai. This project is seen as important for UNEP as described by UNEP Executive Director Achim Steiner: “The Mau Complex is of critical importance for sustaining current and future ecological, social and economic development in Kenya. The rehabilitation of the ecosystem will require substantial resources and political goodwill. UNEP is privileged to work in partnership with the Government of Kenya towards the implementation of this vital project." In a country suffering from a crippling drought this is not an easy time to be raising such a vast amount of money, but the future security of the country seems entwined with the security, protection and restoration of its greatest forest.